It will take place between 8th and 13th of April 2019 in the cities of Beijing and Wuxi the “ENRICH in China Matchmaking Tour”. This mission will provide a unique opportunity to establish partnerships with leading Chinese healthcare organizations and it aims to open up business, research and innovation cooperation opportunities in these two cities. The mission will enable participants to establish connections with leading healthcare organizations, to visit leading Chinese healthcare Science Parks and R&D organizations and to engage in networking and B2B sessions. These activities will be transversal to the two cities. The mission will also provide free access to 2019 Taihu (Mashan) Life Science and Healthcare Forum and China (Wuxi) International Medical Equipment and Pharmaceutical Supply Chain Exhibition. 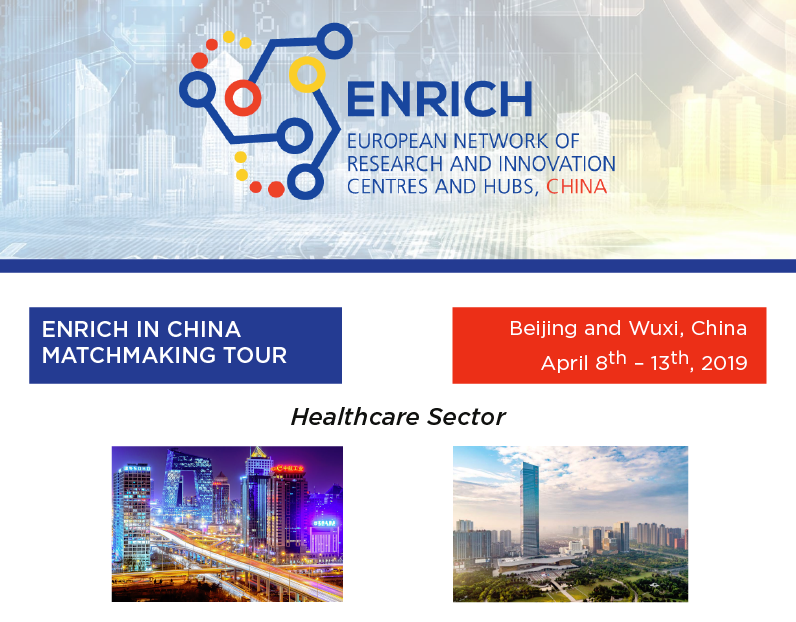 We welcome the participation of any organization from the European Union and Associated Countries, interested in initiating or deepening their cooperation with China in the healthcare area - Startups, SMEs, business associations, clusters, research institutes, universities, science parks, incubators, accelerators and funding agencies. Deadline for application is March 8th 2019. For more information and to register, please click here.